The crane is at West 57th Street. No injuries are reported, but streets have been cleared as a precaution. 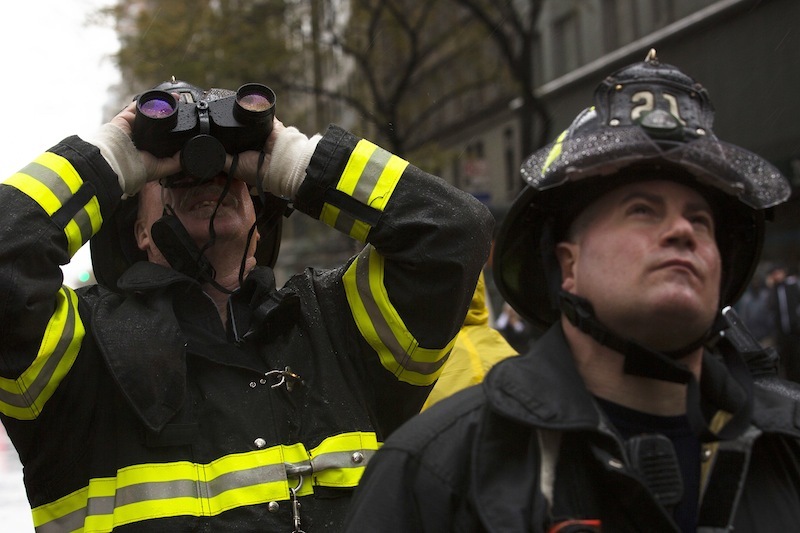 Some buildings, including 900 guests at the Parker Meridien hotel, were being evacuated as a precaution and the streets below were cleared, but there were no immediate reports of injuries. City officials didn’t have a number on how many people were told to leave. 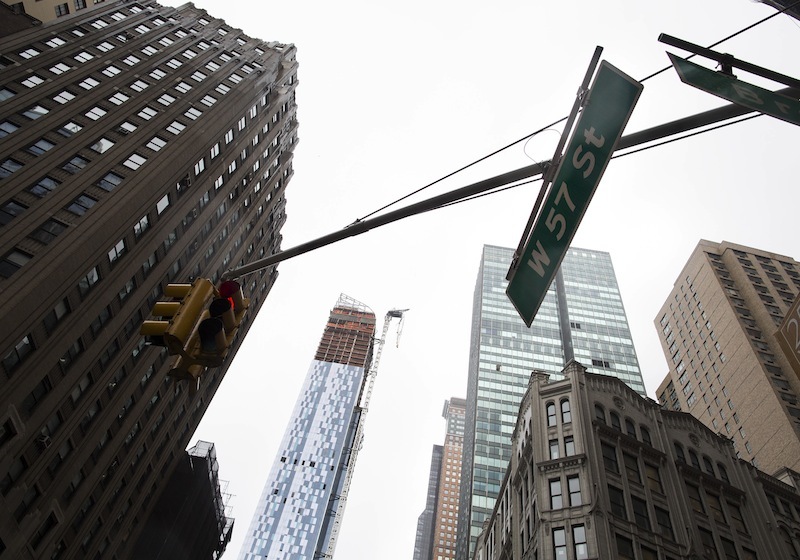 The nearly completed high-rise is known as One57 and is in one of the city’s most desirable neighborhoods, near Carnegie Hall, Columbus Circle and Central Park. It had been inspected, along with other city cranes, on Friday and was found to be ready for the weather. Mayor Michael Bloomberg said later Monday it wasn’t clear why the accident happened. “It’s conceivable that nobody did anything wrong and there was no malfunction, it was just a strange gust of wind,” Bloomberg said. Engineers and inspectors were planning to hike up 74 flights of stairs to examine the crane. The harrowing inspection was being undertaken by experts who are “the best of the best,” city Buildings Department spokesman Tony Sclafani said. The crane was owned by Bovis Lend Lease, one of the largest construction companies in the city. Bloomberg was careful not to blame the company, and said it would be days before officials figured out what happened. A spokeswoman for Bovis Lend Lease said the company was working with city officials to secure the structure but the weather remained severe. There was no immediate response to a message left with the developer, Extell Development. Phone numbers for several people whose names appear on permits for the crane rang unanswered. The New York Times recently called the building a “global billionaires’ club” because the nine full-floor apartments near the top have all been sold to billionaires. Among them are two duplexes under contract for more than $90 million each. “We heard a noise, but we didn’t know what it was,” she said. Minutes later, she and her neighbors were told to leave. “Just because it’s inspected doesn’t guarantee that God doesn’t do things or that metal doesn’t fail. There is no reason to suspect at this point in time that the inspection wasn’t adequate,” Bloomberg said. In April, the agency got a complaint that the heavy ball at the tip of a crane at the site came loose and hit the materials it was trying to lift, knocking some of them onto an adjacent building’s scaffolding. Officials stopped work at the site for a day and issued a violation notice, records show. Those accidents spurred the resignation of the city’s buildings commissioner and fueled new safety measures, including hiring more inspectors and expanding training requirements and inspection checklists. Like Monday’s accident, one of the 2008 crane collapses also centered on the rig’s long, mobile arm, known as a boom. In the May 2008 accident, the boom broke off a roughly 200-foot-tall rig, crashed into a nearby building and plummeted to the ground. Prosecutors blamed that collapse on what they called a penny-pinching repair to a crucial component that lets the boom swivel. Lawyers for that crane’s owner, who ultimately was acquitted of manslaughter charges, said the operator made a mistake that tipped the boom over backward and snapped it.